Laying down covers and performing light topdressing are two methods superintendents can use to protect their turf against winter desiccation. While Annual Bluegrass is susceptible to both winter desiccation and freeze injury, Creeping Bentgrass is more affected by desiccation than freeze injury. If superintendents expect dry conditions and choose to fight desiccation by applying covers, they should apply a fungicide in the event that the cover increases the turf’s susceptibility to snow molds. Annual Bluegrass can survive under ice between 45 and 90 days, while Creeping Bentgrass can survive under ice between 90 and 120 days. Superintendents who use impermeable covers should also pull the covers off as temperatures once again hit 40 to 50 degrees. Permeable covers help re-establish putting greens in the spring. Covers are a better practice than topdressing, but they are more expensive. Researchers consistently ward off winter desiccation with aggressive fall topdressing applications. Topdressing all year-round is the best way to prevent winter desiccation, so you might NOT think about it in July, but that July topdressing is helping to keep the turf crowns buried. Superintendents should NOT treat for Snow Mold Diseases before the first frost, but they should treat before snow cover if they are in an area where disease pressure is high. The Snow Mold fungi begin to germinate and grow when soil temperatures reach about 50 degrees Fahrenheit, so an application three to four weeks prior to your final application can act to reduce Snow Mold inoculum at an early stage. Microdochium Patch ( Pink Snow Mold ) can grow without snow cover. Microdochium Patch more often develops between December and February. Gray or Speckled Snow Mold can begin growing in October, but it is NOT usually visible until the spring. A high-potassium ( with high-phosphorus ) fertilizer mixture may be used to suppress Microdochium Patch ( Fusarium Patch, Pink Snow Mold ) disease. The higher the top growth is, the deeper the root system will be. In the north, pigments can be applied in the late fall to help boost plant health coming out of winter as turf recovers from damage in the spring. Pigments warm the canopy by absorbing more light because they’re dark, which may help the plant grow quicker ― because coming out of winter dormancy, soils are cold. As with any other time of year, superintendents will benefit through the winter by balancing their soil fertility ahead of time. Apply nitrogen in the fall. Standard application rates are approximately a half-pound per thousand square feet for short cut turf and three-quarters-of a-pound to a pound for rough. Green turf is a sign of health, even during autumn months. Green turf is NOT normally an indicator for an impending cold temperature calamity. With late-fall nitrogen fertilization, root development will be favoured, and shoot growth will be reduced. Late-fall nitrogen fertilization will potentially decrease turf susceptibility to cold temperatures. When average autumn temperatures range from 7 to 10 degrees Centigrade ( 45 to 50 degrees Fahrenheit ) for a period of three to five consecutive days, shoot growth will stop ― roots remain active late into the fall, longer than shoots. This is the time to apply fertilizer for optimum late fall nitrogen fertilization. Nitrogen applied after mid-November is called dormant nitrogen fertilization, and it is NOT likely that it will improve the plant’s resistance to cold temperatures. Late-fall nitrogen fertilization will NOT « awaken » turf, nor will it increase turf susceptibility to cold temperatures. Before blowing out their irrigation systems and shutting down their golf courses, superintendents in the North should follow these guidelines. The answer to the question of how to prepare for winter, even in the North, is highly specific based on region. Peaks, valleys, oceans, lakes and latitudinal and longitudinal coordinates divvy up the golf courses that should consider one management practice over another. Here, turf experts offer their advice on what superintendents across the North can do. DRY AND WINDY CONDITIONS in areas such as Western Iowa, Nebraska, and farther west toward the Rocky Mountains, can lead to WINTER DESICCATION, says Dr Nick Christians, professor of turfgrass management in Iowa State University’s Department of Horticulture. Budget is a major determining factor regarding which route to pursue. Winter watering is also a major practice in drier areas, Dr Christians says. It’s so dry that you’ll lose the grass if you don’t get some water on it. That’s true in Colorado and Wyoming and Western Nebraska and places like that. You’ve got to put some water on them in the wintertime or you’ll lose them. WINTER DESICCATION is less of an issue in areas around Ohio than it is out West, says Dr Karl Danneberger, professor in Ohio State University’s Department of Horticulture and Crop Science. But some superintendents might want to TOPDRESS FAIRLY HEAVY LATE IN THE SEASON for another reason ― FREEZE INJURY. Unlike TOPDRESSING for WINTER DESICCATION, TOPDRESSING for FREEZE INJURY is NOT directly related to budget concerns. The answer to the question of whether to TOPDRESS would be largely determined by what a specific superintendents’ TOPDRESSING PROGRAM looks like for the rest of the year, says Mr Bob Vavrek, director of the USGA putting greens Section’s Central Region. In certain regions, such as the central part of Iowa where Dr Christians conducts research, turf can suffer from WINTER DESICCATION in one year and from SNOW MOLD DISEASES in another year. Winter 2014-2015 was wet there, and 2016-2017 is shaping up to have similar results ― conditions Dr Christian says are good for superintendents. If they go into the fall in good, wet conditions, that is a better guarantee they’re going to get through. If they go when it’s really dry, going into winter, then they’ve got to more carefully prepare for [ WINTER ] DESICCATION. In Michigan and Wisconsin and northern parts of New York and Ohio, SNOW MOLD TREATMENTS become the most important uses of FUNGICIDES on golf courses, Dr Danneberger says. I’ve known guys to miss it. Sometimes the snow will disappear and they’ll get a chance to go out and spray. Many superintendents around the Great Lakes TREAT FAIRWAYS WITH FUNGICIDES FOR THE DISEASE. To the south, in areas such as Columbus, where Ohio State is located, superintendents MORE OFTEN LIMIT FUNGICIDE APPLICATIONS TO PUTTING GREENS AND TEES, Dr Danneberger says. Nearly all of the country can experience PINK SNOW MOLD, and for the Pacific Northwest, and much of the North, PINK SNOW MOLD CAN BE OBSERVED BEGINNING IN OCTOBER. Many combinations of FUNGICIDES can provide quality control and fit different budgets, says Dr Koch, who advises that superintendents speak with representatives. Although fungicide application dates and rates are highly region ― and weather-specific, there is one general truth, Mr Vavrek says. Pretty much every state would at least probably treat putting greens, tees, for SNOW MOLD. Mr Bob Vavrek is director of the USGA Putting Greens Section’s Central Region. Depending on the time of year and the region, superintendents might apply fertilizers in granular form, Mr Vavrek says. Conversely, some superintendents might NOT put down a late fall application at all. The dates between FALL FERTILIZATION and DORMANT FERTILIZATION vary from region to region, Dr Vavrek says. You’re going to see a big difference in a state like Illinois. The days they’re going to recommend in Evansville or let’s say, Carbondale, Illinois, are going to be different than Chicago. In areas that consistently have SNOW MOLD DISEASES, such as Northern Minnesota, Northern Wisconsin, the Northeast and at high altitudes in the Rocky Mountains, superintendents should be particularly careful NOT TO OVERFERTILIZE, Dr Christians says. Researchers in Ohio State University’s Department of Horticulture and Crop Science generally support LATE-SEASON NITROGEN FERTILIZATION, Dr Danneberger says. They have seen ENHANCED ROOT GROWTH AND GREENING IN THE SPRING. If you get on really sandy mediums and things like that, they may say it leaches. But as a general rule, I like LATE-SEASON FERTILIZATION. If a golf course’s soil needs POTASSIUM, ONE POUND PER THOUSAND SQUARE FEET IS A GOOD AMOUNT, Dr Patton says. That’s kind of known as a WINTERIZER-type element, but most research with POTASSIUM shows that if your SOIL TESTS don’t indicate you need POTASSIUM, there’s really NOT a benefit to those late fall POTASSIUM applications. So I just would encourage superintendents to apply POTASSIUM based on what the SOIL TESTS say they need. The author Patrick Williams is a Cleveland-based writer and frequent GCI contributor. Following these tips, superintendents can hone in on the part of the plant they cannot see. Somewhere underground, a sprawling organism trenches in, staving off efforts to come to the light. At least that’s the hope for superintendents, who don’t want a shallow root system to jeopardize their turf’s resistance to winter elements. To keep roots deep, researchers say, they can adhere to the following recommendations. The turfgrass principle of INCREASING MOWING HEIGHTS in the fall goes back decades, but is still important today, says Dr Keith Karnok, professor of turf management in the University of Georgia’s Department of Crop and Soil Sciences. If you can mow it just a little bit higher, there’s more leaf material up there for the leaves to intercept the sun, to make the carbohydrates that will then go to the root system and be stored. Bermudagrass fairways in the Transition Zone are SUSCEPTIBLE to winterkill, says Dr John Sorochan, distinguished professor of turfgrass science in the University of Tennessee’s Department of Plant Sciences. Superintendents can sustain SIGNIFICANT ROOT GROWTH on those fairways by INCREASING MOWING HEIGHTS to around THREE-QUARTERS OF AN INCH or a little bit higher. That helps, one, insulate the crown of the grass a little bit, but more so it encourages THE TALLER THE GRASS, THE LONGER THE ROOTS, the more rooting, so for the winter storage of nutrients and carbohydrates to go into those growing points below ground. The superintendent needs to do what he can do to protect the grass and have it come back the next year. Although golfers often express concerns about higher grass, it is worth it, Dr Sorochan says. Root-feeding fertilization on putting greens can go a long way to maintaining root growth, says Dr Douglas Karcher, professor in the University of Arkansas’ Department of Horticulture. Superintendents can apply either a spray or granular fertilizer. Make sure that it’s NOT a nitrogen-only, that it includes ALL NUTRIENTS that might possibly be limiting growth, and so ( superintendents ) would need to have a soil test and have an idea of what needs to be applied. POTASSIUM and IRON can become deficient in sandy putting greens root-zones, Dr Kays says. Generally, right before or after aeration would be the best time to fertilize, Dr Karcher says. Even when it’s gotten really cold in late fall and we’re NOT mowing much grass and we’re NOT getting a lot of clippings in the putting greens mower baskets, THOSE ROOTS ARE STILL GROWING ALMOST UP UNTIL THE TIME WHEN THE SOILS ARE STARTING TO FREEZE. So that’s something that can be done later in the fall — a good complete fertilization using quick-release nitrogen sources. Fall fertilizer application rates vary depending on grass type, region and other factors, but superintendents should be careful with their NITROGEN APPLICATIONS because TOO MUCH NITROGEN COULD SLOW ROOT GROWTH, Dr Karnok says. If you can HOLD BACK ON YOUR NITROGEN SOME, your roots will be better off for it, which means you’re holding back the top growth from growing rapidly, so the carbohydrates are going to be stored in the plant or they’re going to root growth. Many superintendents who lose turf in the summer aim to recover by applying nitrogen heavily, Dr Karnok says. They say, « Well, I’ve lost so much grass, I’ve got to get this grass to spread back over, and the only way I’m going to do that, short of re-establishing, is get it to grow faster ». If superintendents need to recover from summer losses, they can choose to apply extra NITROGEN so long as they effectively maintain growth through other processes. If recovery isn’t a concern, they can save themselves trouble in the long run by applying LESS NITROGEN. Although it is common to apply light and frequent irrigation in the absence of rainfall throughout the summer, following aeration in the late summer or early fall, superintendents should consider switching to a deeper, less frequent cycle, Dr Karcher says. Once roots are 5 or 6 inches deep, then you can water to that depth. Then you can go every second or third day. By doing that, you will keep the surface a little drier between irrigations, and that will encourage even more root growth. Because conditions vary among golf courses, superintendents will need to determine for themselves how to best alter their irrigation cycles to fit fall conditions, Dr Karcher says. By irrigating less frequently, superintendents will maintain the higher oxygen levels within the first few inches of the root-zone. Often, sands in the root-zone of putting greens become coated with what Dr Karcher describes as a « wax-like » organic substance, and those sands become HYDROPHOBIC over time. A common issue, DRY SPOTS can appear on any putting greens that is prone to WETTING AND DRYING CYCLES. LOCALIZED DRY SPOTS on putting greens are easy to detect in the summer because those putting greens are QUICKLY DRYING OUT, Dr Karcher says. Although DRY SPOTS aren’t as evident in the fall, they are still there. I would encourage a superintendent to go ahead and treat with a wetting agent through the fall just to make sure that their entire root-zone is holding water because roots will NOT grow well anywhere that is deficient in water. By just continuing with a good WETTING AGENT PROGRAM into the fall, they will maximize their fall root growth. WETTING AGENTS can benefit superintendents through the winter. Preliminary data indicate early winter applications help reduce WINTER DESICCATION injury on ultra-dwarf Bermudagrass putting greens, Dr Karcher says. It is inevitable as fall arrives there will be FROST and with FROST comes the dreaded FROST delay [ on the golf course ]. We are all aware of the science associated with FROST on turf. The turfgrass plant is mostly water, and FROST is simply frozen dew that has crystalized on the leaf blade of the turf. While the turf is in this state, any traffic will likely crush the frozen cell wall and cause damage to the plant. We have all seen the DARK FOOTPRINTS appear after someone ignored the « Frost Warning / Putting Greens Closed » signs. It is also common sense that putting greens, because of their value and their tendency, to hold FROST ( before other turf with higher heights of cut ) that they are often the CENTER OF A FROST MANAGEMENT PROGRAM. I managed cool season putting greens in the transition zone for 30 years and every fall we had to retrain everyone about the subtle nuances of managing FROST delays. • Communicate the reasons for and procedures connected to your FROST MANAGEMENT PROGRAM consistently throughout the operation. Use a variety of methods but make sure the verbiage and message is consistent. This includes everything from signage, e-mail blasts, tee sheet notes, web sites and any social media such as Twitter, Facebook etc … FYI, this should start about two weeks before the average first FROST date in your area. • There can be only one. The most senior person on duty from the golf course maintenance staff should be the SOLE AUTHORITY on when the FROST delay is over. This will eliminate confusion about just what is the temperature and how can FROST still be there when the wind is blowing thirty miles an hour. One expert, his call and NO exceptions. FYI, NEVER commit to a start time unless you want to bet your job on it. • Use a combination of rerouting ( avoiding putting greens that are shaded and thus will be the last putting greens that the FROST will clear ) and temporary putting greens ( be sure these are located away from the FROST covered putting greens ) to accommodate the golfers as soon as possible. On days where HEAVY FROST is forecasted plan a late morning shotgun start. 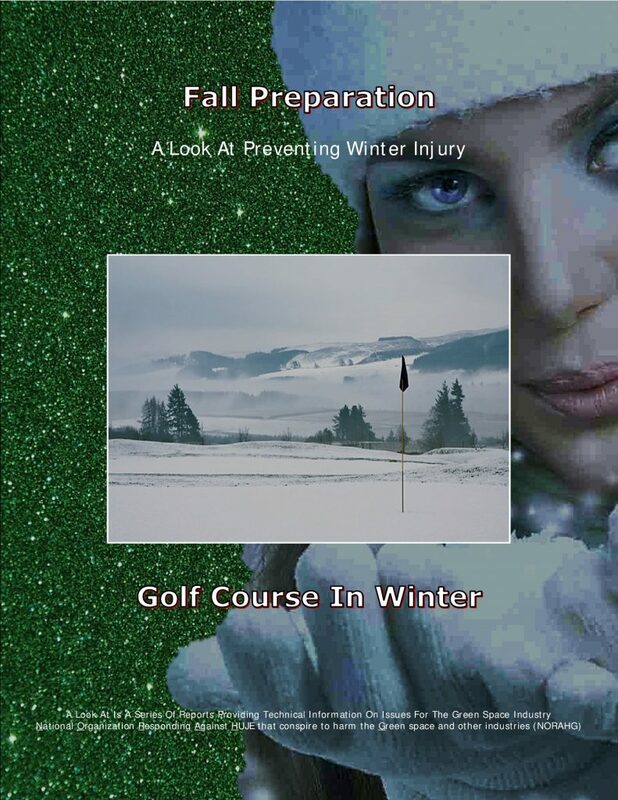 • Staff accordingly to move quickly through the golf course set up procedures as golfers will expect the instant the FROST lifts they can begin play. The reality is that you must be sure the danger of FROST DAMAGE has passed before you can begin the golf course set up for the day. We have all seen a light FROST lift only to resettle as the sun crests the horizon. 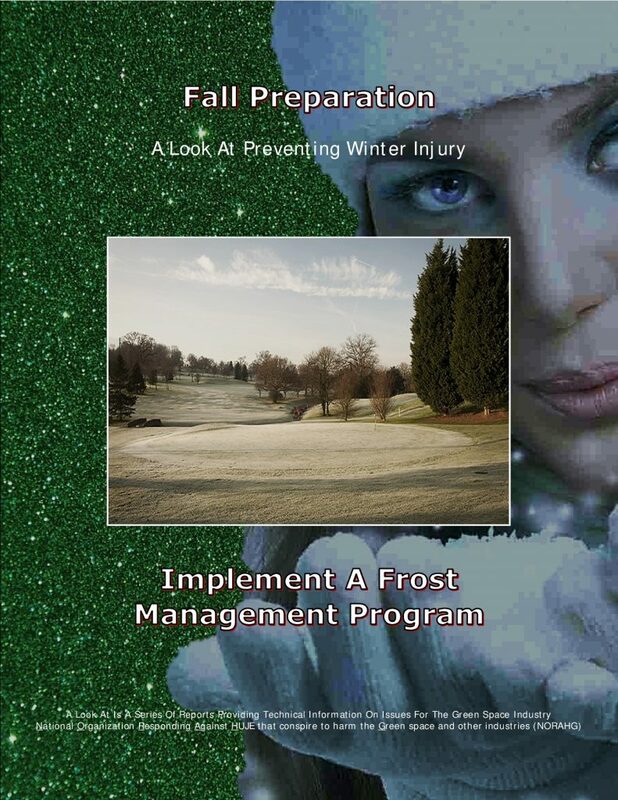 Managing FROST DELAYS is one of the most critical things a superintendent does in the Fall. Make sure the golfer sees and understands that you want him to play as much ( or more ) as he wants to play and you are simply PROTECTING THE Golf course and its putting greens assets and you need their cooperation. Industry experts reveal the most effective methods for PROTECTING putting greens FROM HARSH CONDITIONS. A harsh winter forecast weakened when the National Oceanic and Atmospheric Administration took down their La Niña watch in September 2016. Although California superintendents felt let down when El Niño failed to haul in the water needed to normalize operations in 2015-16, those in the North might be relieved to hear that THIS WINTER COULD BE MILDER THAN PREVIOUSLY EXPECTED. When it comes to WINTERIZING PUTTING GREENS, the forecast for a regular winter means the ability to adhere to established practices while taking some new risks. Talk surrounding the benefits of an AGGRESSIVE FALL TOPDRESSING PROGRAM dates back years, but is augmented by continuing research. Meanwhile, industry experts weigh in on the pros and cons of affordable COVERS and the ever-growing popularity of PIGMENTS. The winter of 2013-2014 saw particularly SEVERE WINTER-KILL on Annual Bluegrass putting greens across the Midwest and into the Northeast. At the time, Dr Edward J Nangle, assistant professor at the Ohio State University Agricultural Technical Institute, was working as director of turfgrass programs for the Chicago District Golf Association. Dr Nangle suspected the issues were brought on by ICE ENCASEMENT as well as DIRECT TEMPERATURE KILL and CROWN HYDRATION. I think we saw soil temperatures into the low 40s even in that mid-January time period in Chicago. It seemed like the Annual Bluegrass started to get active as well. So my perception is that we also had some CROWN HYDRATION going on, which then caused DIRECT KILL of the Annual Bluegrass as well. A Chicago District Golf Association survey of superintendents in the district revealed methods they took in the winter of 2013-2014 ― one of the area’s worst on record ― to battle damage, Dr Nangle says. Those who used PERMEABLE COVERS saw mixed results. Many of the superintendents who had negative experiences were UNABLE TO PREVENT EVENTUAL SNOW MELT FROM GETTING UNDER THE COVERS. Superintendents who COVER DURING THE WINTER will be best off by WATER-PROOFING their putting greens through processes such as BURYING THE COVERS around the putting greens edges, Dr Nangle says. Roughly every seven to 10 years, the crew at North Shore Country Club in Glenview, Illinois, has to deal with direct winterkill, CROWN HYDRATION or ICE ENCASEMENT, says superintendent Mr Dan Dinelli. Crew members lay down the woven PERMEABLE COVERS after the golf course’s Annual Bluegrass putting greens have HARDENED and SOILS START TO FREEZE, and remove them when SOILS BEGIN TO THAW. Depending on size, one cover costs roughly $1,200, prior to labor costs. I like to deep-tine [ soil aeration ] the greens just before covering going into winter with OPEN HOLES, which is nice to HELP DRAIN WATER away from crowns, and the COVER PREVENTS THE THREAT OF [ WINTER ] DESICCATION. Dr Kevin W Frank is associate professor and extension turfgrass specialist in Michigan State University’s Department of Plant, Soil and Microbial Sciences. 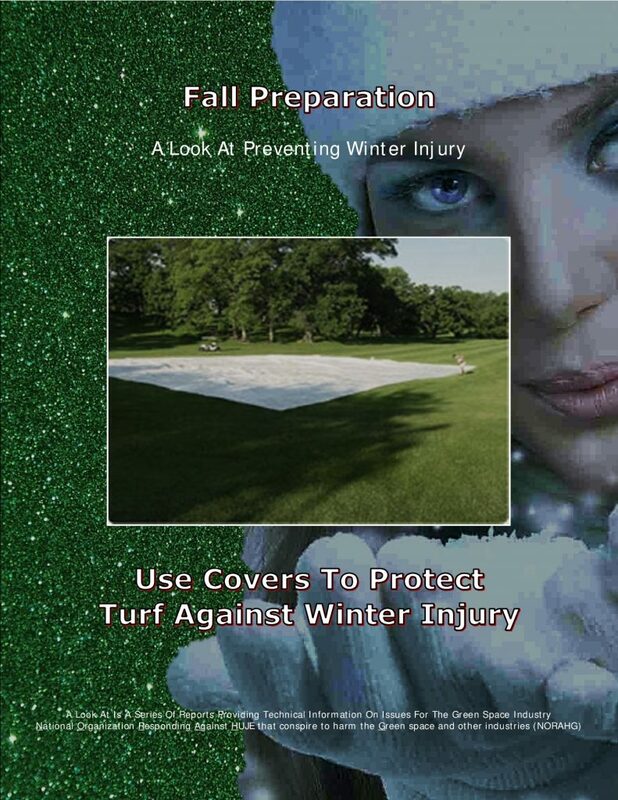 If available, PERMEABLE COVERS should be used to protect putting greens from low temperatures and WINTER DESICCATION. 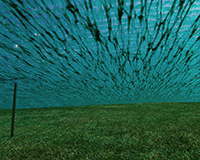 However, they do NOT always prevent damage from EXCESSIVE ICE COVER. IMPERMEABLE COVERS, on the other hand, PROTECT PUTTING GREENS FROM ICE COVER, but need to be applied tightly so water does NOT get underneath them, Dr Frank says. 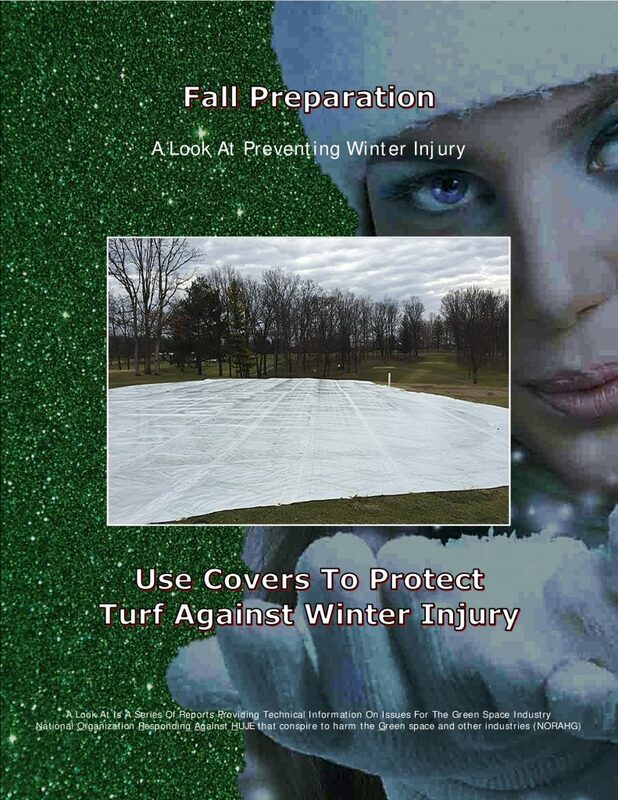 Applying COVERS often takes three to four days, but laying down IMPERMEABLE COVERS could take longer than PERMEABLE COVERS because it takes time to lay down staples to prevent water from running underneath them. If a superintendent decides to VENT, it also takes additional time to lay down tubes. COVERS are certainly NOT fool-proof, but some [ golf ] clubs are using IMPERMEABLE COVERS and VENTING them throughout the winter to protect their Annual Bluegrass greens. Although I don’t have a large sample size in Michigan, these appear to be successful. Plant crowns are expected to lose some moisture in the winter. But wind and dryness in areas such as the Great Plains can push the crown moisture of Creeping Bentgrass putting greens below its optimal range, says Dr Kreuser. Dr Bill Kreuser is assistant professor and extension turfgrass specialist in the University of Nebraska-Lincoln’s Department of Agronomy and Horticulture. If it’s a hot and sunny winter where it’s just windy and dries out some more, like a desert, then it can get below 50 per cent. When it starts to get to 40 and 30 per cent, then it starts to DIE OFF at a lot higher temperature than it would if it was at that ideal peak crown moisture. Researchers consistently ward off WINTER DESICCATION with aggressive FALL TOPDRESSING applications, Dr Kreuser says. In addition to TOPDRESSING’s numerous BENEFITS, such as increasing firmness and reducing disease pressure, TOPDRESSING in desiccation-prone areas insulates and stabilizes the moisture of turf and prevents moisture from getting lost to the environment. 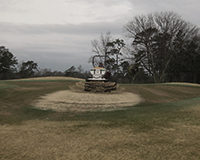 Costs associated with AGGRESSIVE FALL TOPDRESSING depend on location and sand type. In Nebraska, sands are relatively inexpensive. Superintendents should match their TOPDRESSING sand with the sand in their root zone to avoid layering issues. Application rates depend on superintendents’ TOPDRESSING programs for the rest of the year. Superintendents should cut into their putting greens with a knife and look for sand on top of the crown. You’re talking about hundredths-of-an-inch of sand. It doesn’t have to be a ton, but you just want to keep sure that crown is protected from the changing weather conditions. Fall is also a good time for superintendents to TOPDRESS because player rounds are down and they can put down more sand, Dr Kreuser says. If you’re going to do it heavy in the season, even just wait until the golf season is really shut down and then go out with an application. Superintendents can also benefit from applying ADDITIONAL TOPDRESSING to greens on top of hills that are exposed and SUSCEPTIBLE TO [ WINTER ] DESICCATION. Public golf course managers that stay open on warm winter days could be causing harm to themselves, Dr Kreuser says. A lot of prairie golf courses out here where carts have to get funneled in or people walk off the same parts of the putting greens ― that’s where we see the worst of our damage with the [ WINTER ] DESICCATION usually, or one of the areas that can be pretty prone to it. Another issue presents itself for those superintendents who apply an eighth-of-an-inch of sand in November. What Dr Kreuser calls such a heavy « cake layer » buries the thatch underneath it, and could either blow off of the turf or damage it. Superintendents across the United States use PIGMENTS ― also known as COLORANTS, PAINTS, AND DYES ― year-round. Mr Adam Van Dyke is owner and chief scientist of Professional Turfgrass Solutions. A former superintendent at Mount Ogden Golf course in Ogden, Utah, and research technician at Utah State University, Mr Van Dyke has conducted numerous field trials with PIGMENTS. Where Mr Van Dyke is located in the Intermountain West ― a roughly 5,000 to 7,000-foot elevation ― superintendents APPLY FUNGICIDES MIXED WITH PIGMENTS TO FIGHT SNOW MOLD DISEASES. In my opinion, and in my work, specifically with SNOW MOLD DISEASES, there has always been a benefit to using a PIGMENT on golf turf. Pigments don’t influence disease control, but you generally get better spring green-up and recovery when you use a PIGMENT with a fungicide versus just the fungicide by itself. In September, Mr Van Dyke and Dr Nangle instructed a Golf course Superintendents Association of America ( GCSAA ) webinar about SNOW MOLD DISEASES sponsored by CIVITAS manufacturer Intelligro. Dr Edward J Nangle is assistant professor at the Ohio State University Agricultural Technical Institute. The instructors conducted a small poll of roughly 40 superintendents, which revealed about 70 per cent of them use a PIGMENT. In his field trials in Utah, Mr Van Dyke has NEVER SEEN LABEL RATES OF PIGMENTS INJURE TURF, and he has found results improve with higher rates. PIGMENTS can range in price from less than $20 to more than $100 per acre, and CAN BE BENEFICIAL IN A VARIETY OF WINTERIZING SITUATIONS. 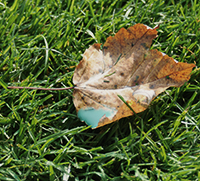 They will NOT directly prevent WINTER DESICCATION injury to turf, but if the DESICCATION period is short, and the plant doesn’t die, any PIGMENT remaining on the leaf could have INDIRECT BENEFITS OF IMPROVED RECOVERY. Superintendents’ concerns for turf health intensify with the approach of winter. Chief among those is protecting their putting greens. In northern locales, where many golf facilities close for the winter, some superintendents COVER THEIR PUTTING GREENS WITH SAND OR STRAW. But others will use PLASTIC or some similar material to provide, literally, AN ADDITIONAL LAYER OF PROTECTION AGAINST SNOW OR ICE DAMAGE. Mr Jeff Johnson, the superintendent at the Minikahda Golf Club in Minneapolis, COVERS his putting greens with a product developed by GreensJacket in Genoa City, Wisconsin. Essentially, it’s a sheet of PLASTIC ( the company refers to it as an IMPERMEABLE COVER ) cut to fit each putting greens. Mr Johnson also utilizes WatchDog data loggers to track what was going on under the plastic. If we had an anomaly and turf died, I could maybe look back at those records. What happened under that cover, there was NO way of knowing. The full GreensJacket system includes NOT only the COVERS and INSULATION, but the company also recommends using a series of sensors at each putting greens site that measure soil temperature and CO2 levels. The system also includes VENTILATION TUBES that allow fresh air to circulate over the putting greens if CO2 levels get too high, which happens about once a week in some parts of Canada. Today, Johnson protects 19 of his 21 putting greens with a COVER. Two of his practice putting greens are comprised of Creeping Bentgrass and are NOT covered. There are a number of artificial COVERS on the market, as well. Each has its own advantages and disadvantages and the turf conditions at a particular facility may dictate what is appropriate or practical. In the 1980s, educators like Dr Anthony J Koski, of Colorado State University, and Dr Wayne R Kussow, of the University of Wisconsin, helped re-shape and modernize our understanding of LATE-FALL NITROGEN FERTILIZATION. More specifically, in 1988, Dr Koski, then working at The Ohio State University, wrote one of the definitive articles that helped modernize our knowledge regarding LATE-FALL NITROGEN FERTILIZATION for those regions subject to cold winter conditions. For golf courses, sod farms, municipalities, and lawn care companies, he claimed that the MOST IMPORTANT FACTOR regarding FALL NITROGEN USE was TIMING. LATE-FALL FERTILIZATION was a concept that flew in the face of so-called common sense, at a time when many « experts » were saying, erroneously, that such a practice would reduce turfgrass resistance to cold temperature injury. Today, we recognize that such fears were almost totally ridiculous. 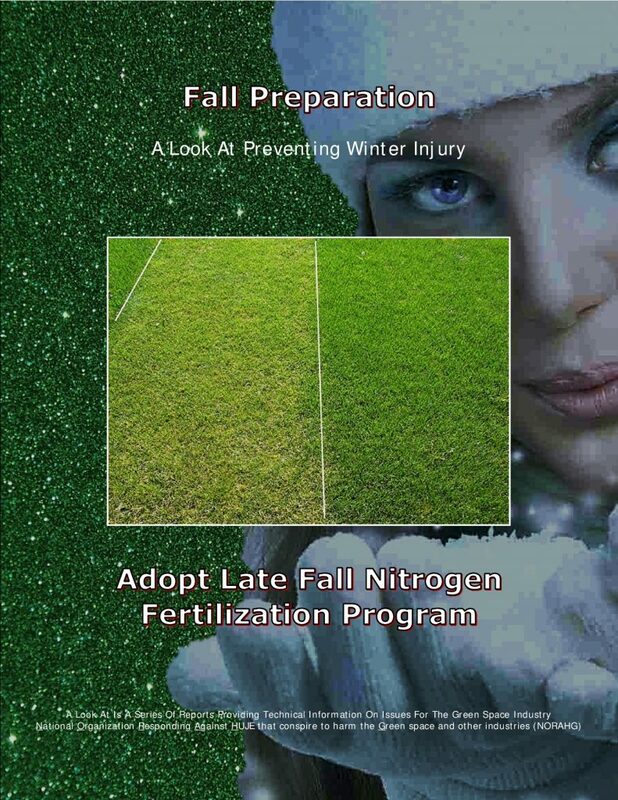 LATE-FALL FERTILIZATION is an important part of the TOTAL NITROGEN FERTILIZATION PROGRAM. Nevertheless, the turf manager must be reminded that he role of NITROGEN in turfgrass maintenance is important THROUGHOUT THE ENTIRE GROWING SEASON, including the fall months. For those turf managers that are concerned that LATE-FALL NITROGEN FERTILIZATION may « awaken » turf during the fall months, we urge them to bear in mind that lowered light and diminishing temperatures are the true environmental « cues » that signal all plants that it is time to prepare for winter dormancy. It is a mistake to believe that nitrogen applications will so easily « over-ride » the effects of these « cues ». When NITROGEN is applied as LATE-FALL NITROGEN FERTILIZATION, a large portion of the plant’s carbohydrates will be placed into storage. This is good for the plant’s resistance to cold temperatures. It is also good for a QUICKER SPRING GREEN-UP OR FASTER RECOVERY FROM FOLIAR WINTER DAMAGE. When NITROGEN is applied as LATE-FALL NITROGEN FERTILIZATION, the first application of SPRING NITROGEN can be DELAYED for at least TWO TO FOUR WEEKS. Nursery sod growers that employ LATE-FALL NITROGEN FERTILIZATION have reported that turf is much more heavily « knitted » for spring harvest. Moreover, in some cases, the harvester has actually been forced to slow down slightly because of the denser root mass. The most important factor regarding LATE-FALL NITROGEN FERTILIZATION is TIMING. This type of fertilizer application must be performed when ALL SHOOT GROWTH HAS STOPPED. For example, in Eastern Canada, this time period is likely to occur between LATE OCTOBER and MID-NOVEMBER. For municipalities and lawn care companies, LATE-FALL NITROGEN FERTILIZATION may be defined as 1.25 to 1.75 pounds of NITROGEN per one thousand square feet in a single application within the time period of LATE OCTOBER AND MID-NOVEMBER. The benefit of LATE-FALL FERTILIZATION ON PUTTING GREENS turf may be of DUBIOUS VALUE. AFTER the optimal time period for LATE-FALL FERTILIZATION ( after mid-November ), NITROGEN is merely applied to turf that is in a DORMANT STATE. At this time, there can NO longer be sufficient root uptake of NITROGEN to provide the benefits of LATE-FALL FERTILIZATION. 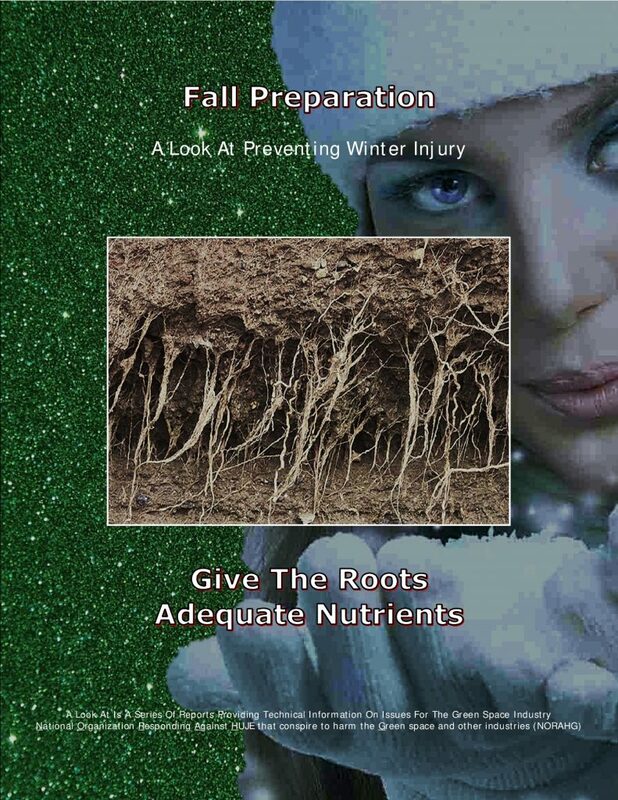 Obviously, once the ground is frozen, there will be NO uptake of ANY nutrients. At this time, there will be NO further uptake of NITROGEN, and NO significant storage of carbohydrates. The fertilizer will simply remain on the surface of the soil, and will essentially become available during the following spring, once the snow has thawed and temperatures begin climbing. This may be good for a quicker spring green-up or faster recovery from foliar winter damage. This type of NITROGEN FERTILIZATION may potentially reduce root development, in a fashion similar to the effects of excessive spring fertilization. Nonetheless, it should be pointed that some studies have indicated that DORMANT FERTILIZATION on golf course turf with Milorganite, an organic slow-release source of NITROGEN, may actually improve root growth. When NITROGEN is applied to DORMANT TURF, the first application of SPRING NITROGEN can be delayed for at least TWO TO FOUR WEEKS. In order for LATE-FALL or DORMANT NITROGEN FERTILIZATION to work optimally, turf must be previously maintained with a BALANCED fertilizer program. When NITROGEN is supplied in MODERATE quantities EARLY IN THE FALL ( i.e. LATE AUGUST to LATE SEPTEMBER in Eastern Canada ), turf will remain putting greens throughout the fall. This is a good indicator for the plant’s resistance to cold temperatures. Many « experts » have claimed, erroneously, that putting greens turf in the fall is an indicator that turfgrass will have diminished resistance to cold temperature injury. For municipalities and lawn care companies, MODERATE EARLY FALL NITROGEN FERTILIZATION may be defined as 1.00 to 1.25 pounds of NITROGEN per one thousand square feet in a single application between LATE AUGUST and LATE SEPTEMBER. On golf course putting greens, MODERATE EARLY FALL FERTILIZATION may be defined as 0.5 pound of NITROGEN per one thousand square feet applied EVERY TWO WEEKS. It should be noted that one application of SOME very high-quality slowly-available fertilizer ( i.e. long-chain methylene ureas ) may provide ADEQUATE NITROGEN for a period of four to six weeks. Hence, only a single application may be required in the early fall. A BALANCED fertilizer is recommended at any time during the fall, based upon, of golf course, SOIL TESTS and previous experience. The so-called « winterizer » fertilizers, which is extremely high in POTASSIUM, are of DUBIOUS VALUE. For example, a 1-to-4 ratio of NITROGEN-TO-POTASSIUM. Fertilization that is excessively high in POTASSIUM, but very low in NITROGEN, will NOT likely serve the better interests of turf. However, we should all keep in mind that many research reports have indicated that a 1-to-2 ratio of NITROGEN-TO-POTASSIUM can provide OPTIMAL COLD TEMPERATURE RESISTANCE. This is NOT necessarily an extremely high use of POTASSIUM. We should all bear in mind that normal fertilization programs performed in early fall, LATE-FALL, and DORMANT, may NOT be appropriate for turf that is deemed « sensitive » to high, or even moderate, NITROGEN, and even POTASSIUM, fertilization. Turfgrasses growing in shade are naturally « sensitive » to NITROGEN, as well as turf that mowed very short ( i.e. putting greens ). Some turfgrass species may be naturally sensitive to NITROGEN. Examples of « sensitive » species include the bentgrasses, the fine-leaved fescues, and rough bluegrass. Annual Bluegrass on home lawns can act as a « sensitive » grass. All turfgrasses can become « sensitive » to NITROGEN when unseasonably dry conditions occur in the fall. All such conditions will render turf « sensitive » to high or excessive NITROGEN, although problems do NOT frequently occur in EARLY FALL. For municipalities and lawn care companies, MODERATE EARLY FALL NITROGEN FERTILIZATION ON SENSITIVE TURF may be defined as NO GREATER THAN 1.00 pound of NITROGEN per one thousand square feet in a single application BEFORE LATE SEPTEMBER. You can only do so much for turf that is « sensitive ». Using a fertilizer with a ratio of 3 : 1 : 2 ( NITROGEN : PHOSPHORUS : POTASSIUM ), WILL DECREASE TURF SUSCEPTIBILITY TO CERTAIN DISEASES, when compared with NITROGEN alone. Examples of fertilizers with a 3 : 1 : 2 ratio are 18-6-12 and 15-3-9. These types of fertilizers will tend to be used on golf course putting greens. At least 50 to 75 per cent slow-release nitrogen is suggested. This disease is common in many parts of the nation. It is recommended to use a fertilizer with a 3 : 5 : 5 ratio, and apply it during the fall months. The closest practical example of a fertilizer with this ratio is 15-20-21. This fertilizer is recommended for most types of turfgrasses. Since Fusarium Patch Disease is prevalent under cool and moist conditions; hence, at least 50 per cent slow-release nitrogen is recommended. For those turf managers that have NEVER tried this aspect of the fertilization program, it is suggested that you begin the « learning curve » by observing the results on turfgrass that is growing under good growing conditions. For example, a Kentucky bluegrass lawn consisting of improved varieties located in an open, sunny, and well-drained area. Again, avoid those conditions where turf may be « sensitive » to NITROGEN. To take A LOOK AT these issues, you need facts ! NORAHG is National Organization Responding Against HUJE that seek to harm the Green space and other industries. NORAHG is a NATIONAL NON PROFIT NON PARTISAN organization dedicated to reporting the work of RESPECTED and HIGHLY RATED EXPERTS who promote PESTICIDE REALISM and PESTICIDE TRUTHS. 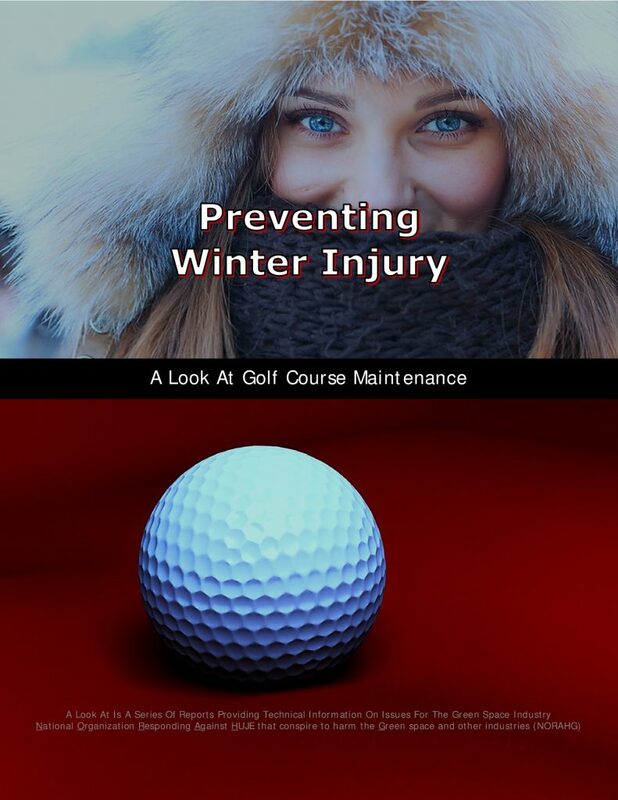 NORAHG produces A LOOK AT, a series of reports providing TECHNICAL INFORMATION on issues such as Career Management, Golf Course Maintenance, Green Alternatives, Lawn Care Maintenance, Summer Stress, Tree & Shrub Maintenance, Turfgrass Pests, and Turfgrass Species. A LOOK AT is destined for the green space industry, nation wide across Canada, the United States, and overseas. A LOOK AT is committed to SOUND SCIENCE, as well as ground breaking original reporting that informs, entertains, and creates real change. All information, excerpts, and pictures contained in A LOOK AT were retrieved from the Internet, and may be considered in the public domain. The information presented in A LOOK AT is for preliminary planning only. Before making a final decision, the turf manager is expected to obtain trusted expert advice from extension specialists, local distributors and/or agronomists. All decisions must take into account the prevailing growing conditions, the time of year, and the established management practices. All products mentioned in A LOOK AT should be used in accordance with the manufacturer’s directions, and according to provincial, state, or federal law. For the official advantages, benefits, features, precautions, and restrictions concerning any product, the turf manager must rely only on the information furnished by the manufacturer. The mention of trade names does not constitute a guarantee or a warranty. NORAHG also produces FORCE OF NATURE, reports that present THE WHOLE TRUTH FROM AN INDEPENDENT PERSPECTIVE about environmental issues, including anti pesticide terrorism. A LOOK AT, FORCE OF NATURE, and their various incarnations, was the brainchild of William H Gathercole (now retired) and his colleagues. Mr Gathercole is now retired, although his name continues to appear as founder of A LOOK AT and FORCE OF NATURE reports.